My previous post explained how to clean up and clear out your vegetable garden for the winter. I now suggest the opposite for your ornamental beds: leave them pretty much alone. Skip the cutting back, the raking, the hauling of plant debris. Give yourself, and your garden, a break. Why? Many of the plants in your perennial garden provide food and shelter to insects, birds, amphibians and other wildlife, not just during the growing season, but in fall and winter, too. And winter is when these resources are most needed. Cleaning out your garden makes it look nice and tidy, but it drives away or kills creatures that help keep your garden a healthy and functioning ecosystem. What should you cut down? Any plants that are diseased. Peonies often get botrytis while phlox is stricken with powdery mildew. If these plants are left standing or fallen foliage isn’t removed, there will be spores in the soil that will infect them the next year. My roses are prone to blackspot, so once the plants go dormant, I pick off every leaf and put them in the trash. Do not compost diseased plants, your compost pile might not heat up enough to kill the pathogens, and you’ll just spread them on your garden in the spring. downed trees, twigs and sticks, rocks, vines, and brush piles. They’ll shelter or feed insects, birds, snakes, salamanders, frogs, and small mammals. Some queen bees need places to hide above ground, others nest below. This entry was posted in Uncategorized, winter garden and tagged compost, fall garden, fall gardening, garden, gardening, organic, Therese Ciesinski, wildlife, winter, winter garden, winter gardening. Bookmark the permalink. 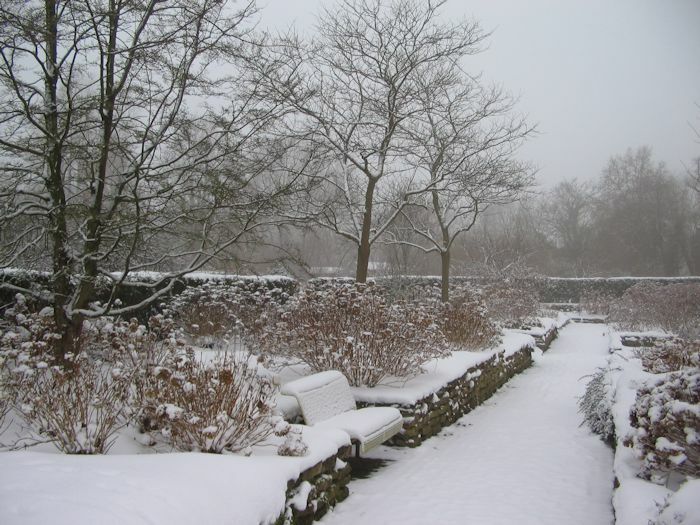 There is something about a garden in rest, covered with a blanket of white snow.